Disclosure: This is a sponsored review. I was provided with a jar of this product for purpose of review. All opinions expressed are solely mine. Many people struggle with getting rid of stretch marks and scars. With my first child I was shocked at how much my skin had changed. I do love the idea of them as my tiger stripes or stripes of motherhood, but I don't like how prominent they are when I want to wear something that shows a little skin. 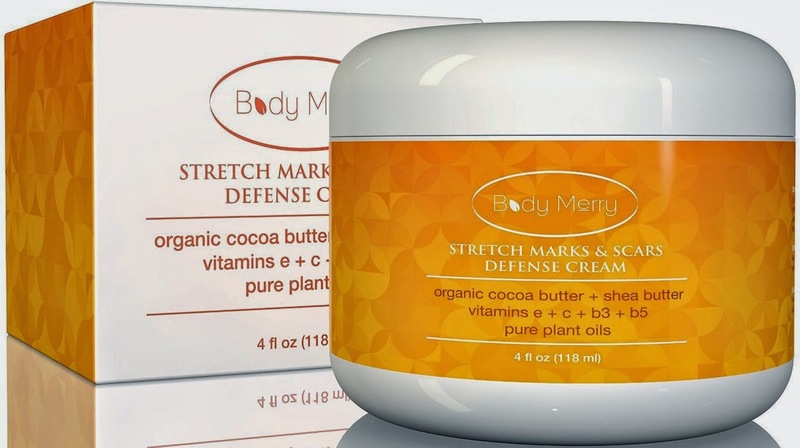 Body Merry’s Stretch Marks & Scars Defense Cream is a natural and organic formula made from cocoa butter, shea butter, pure plant oils and vitamins. This cream provides intense moisturizes and nourishes your skin to help reduce the appearance of existing stretch marks and scars as well as helps prevent the formation of new ones. Like all Body Merry's products, it is free from harsh chemicals such as parabens, sulfates and phthalates. I grew up using lotions with cocoa butter formulas. When I had my first child, shea was all the rage. I'm glad that they see the best of both worlds and put them together to make a great cream. It comes in simple packaging - a plastic wrapped jar in a box. When you unscrew the lid, the most delicious cocoa smell hits your noise. The cream itself is very thick like frosting but spreads nicely when you warm it up in your hands. For me, and my growing baby bump, the cream calms the itchiness and soothes my skin. When I put it on before bed, my skin is still moisturized the next morning. I also find that it is great for my feet and makes me feel pampered before I go to sleep. My marks are less visible and seems to be keeping new ones at bay (though I'm still early on with this child.) This would be great for anyone struggling with stretch marks, new moms to be, or someone looking for a natural alternative to their moisturizer/lotion. Body Merry’s Stretch Marks & Scars Defense Cream is available for purchase online at Amazon.com.